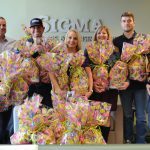 St. Vincent de Paul’s Build a Basket Program set a goal to provide 3000 Easter baskets to needy children in our community this year. We are grateful to have the opportunity to be their partner and help bring a smile to a child’s face this Easter season. Thanks to the generous donations from our employees and their families, we donated 14 baskets to the Build a Basket program this year.